(CNN) -- No major security problems were reported at Michael Jackson's public memorial service on Tuesday in Los Angeles, California, according to police. 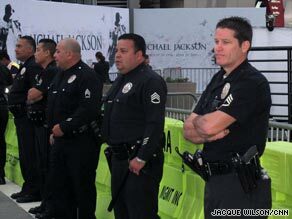 Police gather Tuesday morning in Los Angeles for Michael Jackson's public memorial. The only controversy concerned the issue of who ultimately would pay for the city's efforts to heighten security as thousands of people from around the world flooded the city to say farewell to the pop icon, who died of unknown causes on June 25. A budget crisis pushed the city to ask the public for help in paying for security at the memorial. It set up a Web site where fans can donate. The city is hoping to recoup some of the estimated $2 million to $4 million it cost to have thousands of police and firefighters on hand in case of an emergency. Matt Szabo, spokesman for Los Angeles Mayor Antonio Villaraigosa, said providing security at the event was the city's "obligation" and its "No. 1 priority." But the city does need help, he said. Los Angeles faces a budget crisis and has amassed $530 million in debt. The state of California's budget deficit has climbed to $24 billion. "Even though we're the entertainment capital of the world, we're not immune to the recession," Szabo said. Los Angeles Councilwoman Jan Perry said last week that the city would pay for the security efforts. But there remains some dispute. Los Angeles City Councilman Dennis Zine on Monday called for AEG, the company that owns the Staples Center, to cover all costs of the memorial, arguing the public should not foot any of the bill, according to the Los Angeles Times. The city provided security downtown, where the public memorial for Jackson was held, and also at the Jackson family's private service earlier in the morning. Police said crowds outside the public memorial were not as large as they had anticipated. Between 5,000 and 15,000 people without tickets showed support for the pop star by waiting outside the Staples Center during the service, said Jim McDonnell, an assistant Los Angeles police chief. An exact count was not immediately available. Police asked members of the public without tickets to stay home. Before the memorial began, Police Chief William Bratton said he expected a security effort not seen in decades, calling Jackson's memorial the "largest event we've planned for since the 1984 Olympics." About 3,000 police officers were on hand to ensure the Jackson events proceeded smoothly, McDonnell said. By comparison, about 2,000 officers were deployed for last month's parade and celebration at the Los Angeles Memorial Coliseum for the Los Anegeles Lakers, who had won the NBA championship. By 1 p.m. local time, no police reports had been filed in relation to the event, said Richard French, a police spokesman. Police closed a several-block area outside the Staples Center and closed highway exits near downtown Los Angeles during the event. People without tickets or media passes were not allowed in that closed zone, said Earl Paysinger, an assistant police chief in Los Angeles. Helicopters flew overhead, and sheriff's deputies strolled through with bomb-sniffing dogs. But the security did not seem to affect the reflective and at times festive mood at Jackson's remembrance, according to CNN correspondents.